Leagues, challenge courts, and tournaments provide ample opportunity to keep you active and in the court. 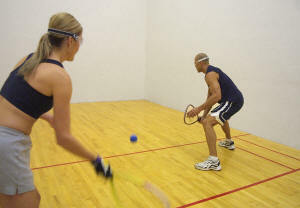 We have four racquetball courts for member use at no additional charge. Courts can be reserved up to 2 days in advance. Two names must be given at the time of the reservation. Courts reservations are for one hour. Two players cannot book a court for two hours. Each player is required to check in for their court time upon entering the club. Failure to check in the court 10 minutes after the scheduled court time will result in the court being given to players on standby. Reservation privileges will be lost with repeat no show/check in for scheduled court time.